Or in English, Welcome Christmas! I am sitting her typing all by myself (wondrous quiet), listening to Bring a Torch Jeanette Isabella, and looking out at cool sunlight as it drenches the dry grass of our yard. Not a flake of snow and unusually warm, but it sill feels like Christmas to me. 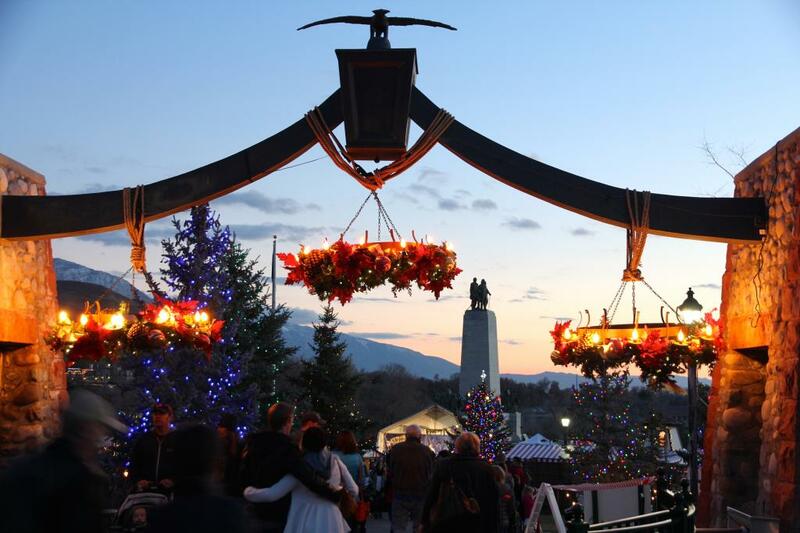 Saturday evening we enjoyed Christkindlmarkt, Salt Lake’s German market, set up in Deseret Village, next to the This is the Place monument. Two other men stand next to Brigham on the monument. One is my great-great-great grandfather, Heber C. Kimball. The kids love to find Grandpa Heber on the north side whenever we visit. And this night was no exception. They happily gave Heber a wave. Spencer and Gordon wore their new basketball jerseys. They are extremely excited that Doug is coaching their team. (First organized sport experience for them.) Forget a Christmas countdown. These two are counting down until their next game. Truly. Straight out of Spencer’s mouth yesterday. Eliza performed in the Tannenbaum parade with her school. So we went early to eat german food and check out the shops. Blitzen was there. And Donder. Cute furry fellas. It was so nice to be with my parents. Both of them speak German. My dad served and LDS mission in Austria and my mother majored in German. So it was especially fun to have them along. We ate Bruges waffles while they ate weinershnitzel, rotkohl, and spaetzle. Wish I’d stood in line for Siegried’s schnitzel. It smelled heavenly. The girls kept warm by the fires. Then this guy took the stage. Amazing. He could play anything on both accordion and cowbells. And sometimes (as pictured here) at the same time! If we hadn’t already been standing, I would have given him a standing ovation. He was fabulous. At one point we were standing right behind President Dieter Uchtdorf and his wife Harriet. President Uchtdorf is part of the First Presidency of the LDS Church. Second counselor to our prophet, President Monson. He’s a favorite among church members for his endearing German accent, ability to identify with all people on matters of the heart, and well, let’s face it, for his handsome looks. It was a sparkling, magical evening. And I couldn’t get enough of the city lights. On a crisp, clear night, there’s nothing like the view of this wide valley with its expanding, winking lights. It was so dark I missed Eliza as she came singing down the parade route with her green ribbon from the Tannenbaum pole. But I did catch the Snow Angel. Then we enjoyed their performance of christmas songs and dances on the stage. Eliza couldn’t keep from smiling. We love her sweet friend Ellie. After the performance, as we were hustling back to the car to warm up and head home, we noticed the full moon, rising bold over the mountain. The kind of moon that stops you in your tracks. Brightest light of the evening. Except maybe for this girl. Light splintering from her face. I can feel her love for simply being alive in this photo. Every day she wraps her arms around this glorious world and the new experiences it is handing her. She is brave, good, and optimistic. Being with her makes me happy. November was a difficult month, riddled with unexpected challenges, one very exciting joy, but also great sorrow for others. Already this new season feels brighter and kinder. I have bought zero presents. The tree is soaking up water in the corner, unlit and undressed. But secret pals are at work in our family, our advent pockets are filled so that each day we can read from scripture, discuss a symbol of Christ. And… #24DaysofGiving is broadening our hearts, changing our focus, and surprising us with an incredible amount of love. I will share stories sometime during the month. So wir begrüßen Weihnachten. In allen Lichts und der Schönheit. Und denken Sie daran Christus. Er ist das Geschenk. So we welcome Christmas. In all its light and beauty. And remember Christ. He is the gift. Giving Away a Book You Need! I'd love to visit your Christkindl market! We have one too, in a neighboring town, but not near as big. Looks and sounds like a lovely evening was had by all. So good to hear from you. How are your cute kiddos!? A very merry Christmas. With love. I was listening to "Bring your torch" this morning too! (Here's the version I was listening to, part of a free music sampler http://noisetrade.com/bloodwatermission/give-love-on-christmas ). I hope you and yours have a beautiful, luminous Christmas Cath! Kel, thank you for the fun listen. I love you dearly! Merry Christmas!! Wishing you all kinds of light and love. This looks so fun! I didn't know you were related to Heber C Kimball! His wife, Ellen Augusta Sanders, who was with that first party (one of only three women) is my ancestor. My great great (maybe a third great…not sure) grandfather's sister. So I guess I'll just have to call you 'cousin' from now on! I am not sure if you would remember me…Jacqueline Gorbutt, wife of Tawn, from the Burke ward at the time. We went on trek with you once, long ago. Now we are in CA. I just wanted to tell you how much I enjoy reading your blog. One of the only blogs out there not wanting to sell me anything, just full of genuine feeling and beautifully written. Hoping you and your family have a wonderful Christmas and sending best wishes. Jackie! Of course I remember you! There is a woman in our current stake that reminds me of you. How fun to hear from you! Yes, Trek. Those are some good memories! Thank you so much for reading. And for sharing your comment. It meant a great deal to me. Merry Christmas to you! Hope life in California is beautiful, sunny, and full. Sending you lots of love! Wraps her arms around this glorious world, indeed. I love Eliza. Is this set up all month? Or a one-time event? What a fun thing!